I had to leave the house at 8am on Saturday to make it to my first class of Catechesis of the Good Shepherd (CGS) training on time. So I had to wake Teresa at 7:15 or so to make sure she was changed, fed and dressed so she wouldn't mind being in the car for almost an hour. I haven't been in a class for 8 years, so it was an interesting day. I'm curious and afraid to see how my note-taking skills have disintegrated over the years when I look back over my notes. I also never had a baby in class with me before. Teresa is at that age where she is still nursing all the time, so I can't leave her home but she is babbling a lot and mobile, which can make her a challenge in a classroom, especially this classroom because our class is held in a Montessori school, which means there are items and materials on very low shelves everywhere you look. Overall Teresa was very good though. I had brought a small quilt with me and set her on it with some quiet toys and she played some. She was rocked to sleep once in her carrier but otherwise fell asleep nursing in my lap twice. But because she does not go to sleep easily, this means she was always overtired and, in the end, probably got about 2 hours worth of naps by the time I got home around 5pm. The only time she was really a challenge during the day was when she would get chatty. A few times a day she gives a speech, never reversed and always improvised and usually loud enough for a few rooms to hear. Of course none of those speeches were during our lunch break so I had the challenge twice of trying to quiet her while trying to take notes. There is just nothing you can do when a baby is fed, dry and happy but in the mood for a little conversation. But besides the instructor, there were 5 women in the class and 2 people absent, so I expect we will have 7 next time. The instructor has 5 grown children, and the other moms have 2, 3, 5, and 8 children, so everyone was very understanding of Teresa. The class itself is very interesting. My background is in philosophy and theology, so the theology aspect of the course is nothing new to me. But my background in childhood development and children's education consists of 1 course in college and staying home with my kids. I've read a few books pertaining to homeschooling, but not much regarding the montessori approach or the natural development of children. So that aspect and how it married the theology of the CGS was very fascinating to me. I picked up Gianna Gobbi's Listening To God With Children while I was there and hope to read it along sideSofia Cavalleti's The Religious Potential of the Child. After introductions, the first class went over the syllabus, covered a brief history of CGS, included a brief silent tour of their Atrium, and went over the Characteristics of the 3-6 year old: Movement, Language, Order, Sensorial, Capacity for Work, Absorbent Mind, Capacity for Relationship/Love, Capacity to Know Things No One has Told Them, Capacity to See the Invisible, Capacity for Wonder, Capacity for Joy, Essentiality and Prayer. That was just before lunch. Then we learned about the Prayer Table and were given a sample lesson in how the Prayer Table is generally introduced and used. I love the idea of the Prayer Table. While I've always wanted and, to some degree, had a prayer "table" or shelf in our home, it has always been at MY level. 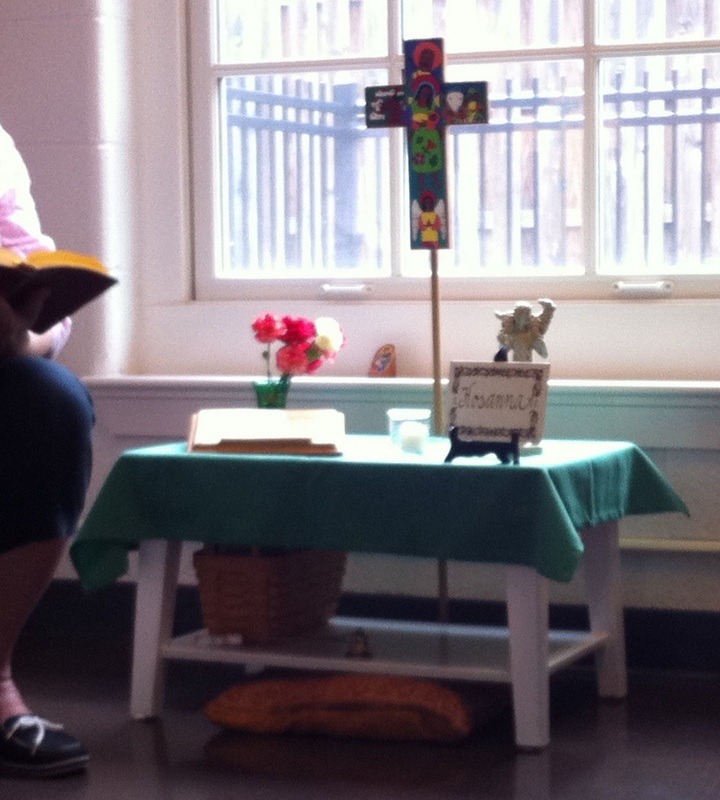 The point of the Prayer Table is to have a surface at the level of the child for a Bible, prayer cards, religious pictures, Cross/Crucifix, statue, and some element from nature (flowers, pinecones, gourds, etc.). There should also be a cushion available if the child wants to simply sit at the table and pray. It is a place for the child to pray. Anytime. I hope and plan to put together one for our home though I haven't quite found an appropriate table yet. It should only be about 1 - 1 1/2 feet tall and most tables are bigger than that. I'd also like it to have a shelf below it to store a basket with prayer cards, etc. We then reviewed what makes the Atrium environment so distinctive and how to make an "Album Page" which is CGS code for a Lesson Plan. I love the idea of familiarizing children, particularly such young children, with the objects but I was concerned if, as the mother of 4 girls, she has ever had a girl come away from the altar declaring she wanted to be a priest. The instructor said she was last asked that question 30 years ago by another mom but in all her years teaching CGS, it had never come up. She said they often role play at the lectionary stand reading from the Scriptures and even giving homilies, but she said they don't really role play at the altar. I have no idea why. Maybe they innately perceive the distinction of the ordained priest and simply section off the activity at the altar as not something they can play at? Anyone else have any thoughts on this? Well, that is my review of my first class. I can certainly see why specific training for this type of catechesis is required but I really do wish they had an internet course or video instruction available to make it more accessible to more people in more places. It would also make it so much easier for moms in situations like mine. In this day and age of information and technology, I really think it is time this was available on a more wide-spread scale. Oh, I'm so glad you posted this. I've heard about this program but only know that it's supposed to be great, so it was good to hear a bit more of the details about it. And the idea of a prayer table in our home is really neat!